One of the reasons I love working at Ayogo is that I have first-hand experience of the power of games to improve health. I was born with a neuromuscular disorder Spinal Muscular Atrophy (SMA). SMA causes weakness and wasting of the voluntary muscles in my arms and legs. Because of this I have never been able to walk and have always been physically behind my peers. Fortunately, I was born in time to experience the birth and growth of the video game industry. The author: David Thomas after being named Ayogo’s employee of the month. Can you spot his pug? I got into gaming with the Atari 2600 and the Commodore 64 when I was quite young. 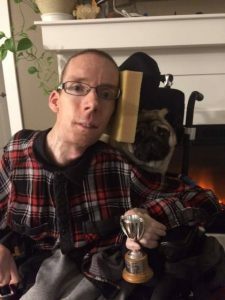 All of my friends were able bodied and video games provided me a level playing field where I could have friendly competition. This was important for me because it gave me the confidence that I was capable of excelling at tasks. I found it also helped the other children see me as not so different from them. Games even helped my Mom. While she watched me play and consistently beat my friends, she realized I could not only be an equal with the other children, but I could be better. Like most people, games provide me with a chance to do things virtually that would otherwise be impossible. I can play sports, drive cars, fight, etc. A 2008 study from PopCap Games shows that I am not alone in finding games useful in dealing with disability. According to the survey, more than 20.5% players of casual video games had a physical, mental or developmental disability. This compared to 15.1% of the American population overall who were disabled at that time. A whopping 94% of those surveyed said they believe playing casual games “provides physical or mental benefits”. improved concentration and mental workouts. Another interesting find was that disabled gamers spent more time playing casual games than the average person. They found that 60% of disabled gamers play casual games for five or more hours per week, compared to 52% of casual gamers overall. Games have the ability to break down barriers and form bonds. As I mentioned earlier, other children quickly saw my similarities after playing video games, rather than my differences. Most people are able to socialize and get together for physical activities like dancing, playing sports, rock climbing. These activities are impossible for someone with a moderate to severe disability. Even the simple act of going to another person’s house can be impossible due to a lack of accessibility. However, online most of these barriers are eliminated. Someone who is completely bed ridden is able to converse and even play with someone next door or on the other side of the world. This power can be very useful, especially when trying to connect people who have rare medical conditions to support one another. Building social games that refocus our attention on ability, success and building social connections is behind Ayogo Health’s games. For example, What’s The Word: for Morquio A support is a social game created by Ayogo for young adults with Morquio A. Biomarin introduced the game at the same time that a new treatment, Vimizim, became available for the treatment of Morquio A. Vimizim is a weekly, 4 hour IV treatment, which places a heavy time demand on patients. But the opportunity of infusion therapy presents a chance to build a community among people who may never otherwise encounter another person with the same condition. What’s The Word: for Morquio A support has two social channels which connect back to the main word game. One channel is a social channel where a conversation starter keeps the whole community (patients, families and friends) engaged on friendly topics. The second channel is in the 1:1 chat with the person against whom you are playing the game. 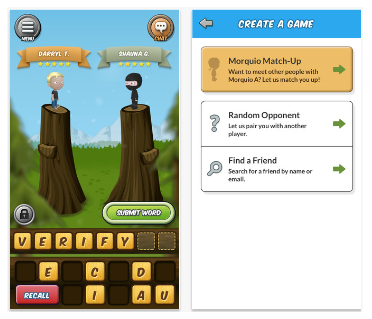 Because people with Morquio A can choose to play against another random player with Morquio A, the game-match is an unintimidating way to make new friends. 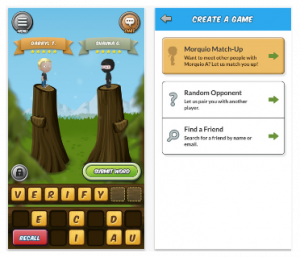 What’s The Word: for Morquio A support is available in the App Store to all people with Morquio A, and their supportive friends and family.